On this site you will find details of Martyn's best selling book What's Tha Up To - Memories of a Yorkshire Bobby and What’s Tha Up To Nah? A Yorkshire Bobby’s Life on the Beat. Martyn is also a keen local historian and metal detectorist – you can find details of his talks and tours on the history of South Yorkshire, in particular the Roman village of Darfield. Martyn and his wife Christine are pictured at Wentworth Garden Centre celebrating the launch of his second book, What's Tha Up To Nah? 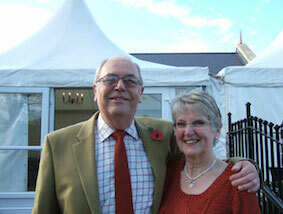 Christine and Martyn were married in 1969 and have three children and six grandchildren. You can read more About Martyn.